New single player content is available on the Prismata alpha server, if you haven’t check it out already. Animated skins are launching next week. Today’s event, which launches at 4PM Eastern, is CLASSIC PRISMATA, featuring an archaic Prismata base set and a selection of overpowered 2nd tab units from back before they were nerfed! Oh, the good old days. A few of our alpha testers might remember when Shadowfang was 6RRR and Antima Comet had 4 supply, but fewer will remember the days when Wall was 6B and had 4HP. Prismata sure was a different game back then! Fortunately, through the magic of years of backups and old repository files, we have access to every version of every Prismata unit that has ever existed! 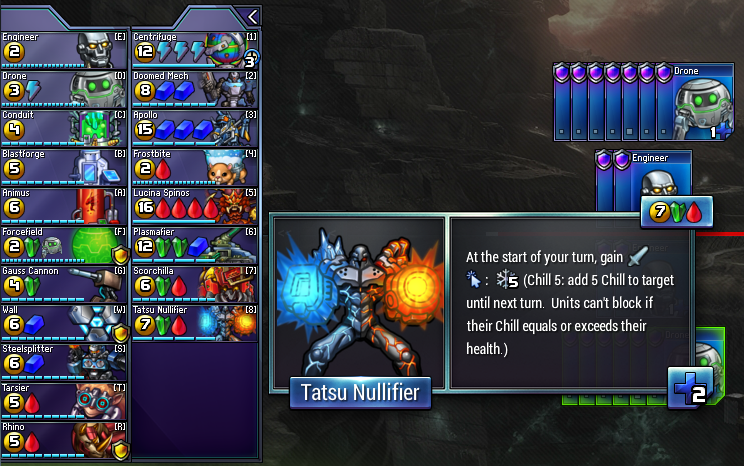 And for this Friday’s event, as a special experiment, we’ve brought back a selection of classic overpowered Prismata units for your enjoyment, many with statlines that haven’t been played since 2013, or even 2012 in some cases! It sure feels weird to play with 4HP Walls, buildtime-1 Tarsiers, and lifespan Gauss Cannons again. Steelsplitter is unchanged in the event (in fact, it’s been at its current statline ever since Prismata was created), but Forcefield costs 1 more gold but has 1 more HP, and Rhino has been replaced by an older version (which is essentially a prompt Electrovore). a 5R prompt Electrovore (which will appear in the event! Internally, these alternate defensive red units all had weird names like “Merc” and “Guppy” and “Elephant”. Rhino itself was chosen after a long struggle over the decision of whether to cut Stamina as a mechanic (we liked it, but also felt it was similar to lifespan in a lot of situations). Ultimately, we ended up keeping Stamina as a red-only mechanic (which has since expanded to blue via the current iteration of Deadeye Operative), and the current Rhino was selected as our final choice for a prompt red defender. The rest of our ideas were rolled into non-prompt units like the current Electrovore, Perforator, and Grimbotch, none of which have really changed since. I hope you’ll have fun trying the event today. As usual, there will be an encore on Tuesday at 4pm Eastern if you miss out!